Region of Syöte offers awesome frames for downhill skiing, relaxed hiking and for an active holiday. There is two ski center on the area and 120 km well-groomed cross-country skiing tracks. 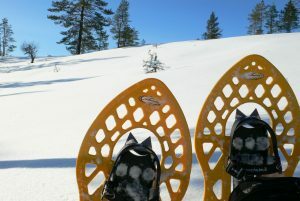 Go to snowmobile or snowshoe safari, try ice hole fishing, dog or reindeer sledding! Summertime offers hiking, canoeing and fishing also guided. 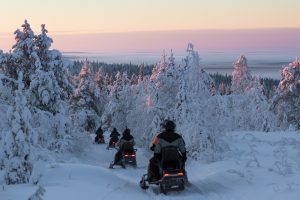 Cruise around mountain by bike- perhaps in the best Finnish terrain or try river tubing in Pärjänjoki. Syöte Booking Centre offers wide and versatile selection of accommodation; cottages, apartments and hotel rooms and activities. We can deliver food catering into cabins or reserve smoke sauna for your group. 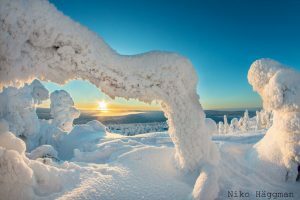 Finland’s southernmost fell area Syöte invites you to experience! Syöte has room to romp and enjoy the thrill of speed in the snowy landscape. Pudasjärvi is the one of the most certain snowed areas in Finland when measuring the thickness of snowpack. Adventures will find their happiness at the hilly terrain, among the shelter of heavy snowed trees. 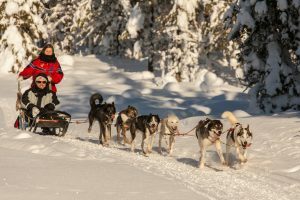 Dog sledding, snowmobiling, 120 km well cared trails and hiking trails, dozens of slopes and plenty of ski lifts offers all levels of skiers great ski experiences.